Traditional block-based and file-based storage systems in large scale storage environments create complex, confusing forms of storage and were never designed for the modern demands of multi-petabyte cloud-scalability. The QStar team decided to make managing massive amounts of archive storage simple with the Kaleidos Object Storage platform. Kaleidos Object Storage is made with standard high performance capacity servers. QStar Object Storage Manager (OSM) software runs on all server nodes and forms a cluster to provide a single pool of storage resources across all nodes. QStar Kaleidos object storage platform designed to store and protect petabytes of data. The QStar Kaleidos is an S3-compliant object storage platform that enables enterprises and service providers to build reliable, private, hybrid or public cloud storage environments that deliver reliability, security and unlimited scalability. 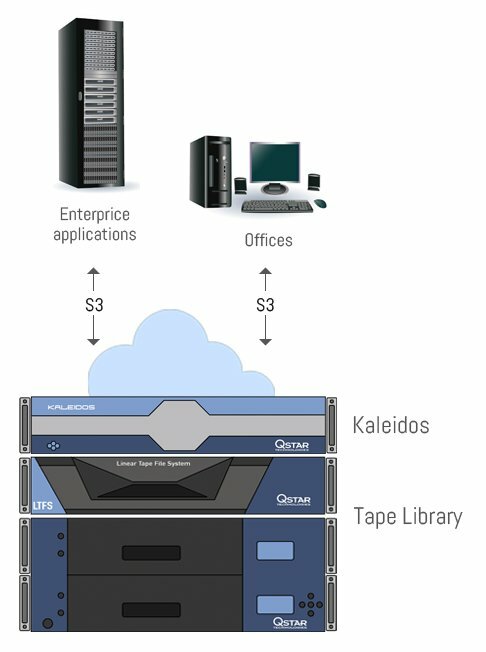 Kaleidos offers enterprise-class customers a tremendous reduction in TCO compared with traditional NAS/SAN storage, unlimited scalability, superior data protection and flexibility, while achieving improved customer retention through enhanced service delivery (SLA), reduced acquisition costs, and enhanced agility through global accessibility across all end user devices. 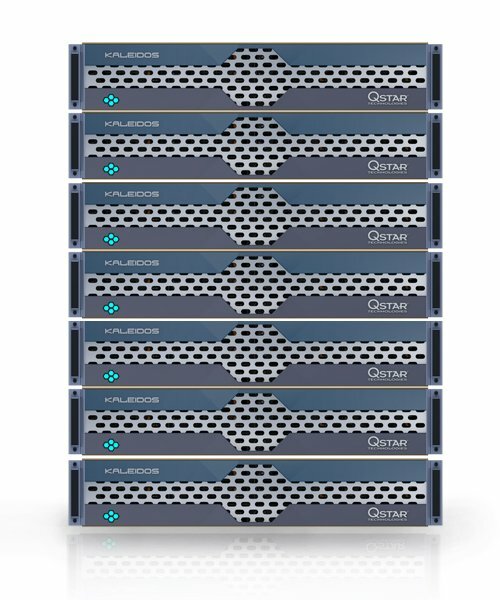 QStar Kaleidos intelligent, fully distributed architecture scales dynamically from three nodes to thousands of nodes allowing the seamless addition of nodes as capacity requirements change from Terabytes to Exabytes. Nodes are automatically discovered and storage rebalanced, to quickly become part of the distributed object store. Over time, newly added nodes can take advantage of enhanced processors or improved disk capacities as they become available, allowing older, less economical nodes to be removed, so efficiency and performance can improve effortlessly as an organization grows, without service downtime. The solution is easily managed by a single administrator and delivers the highest levels of durability and availability, as the self-managing, self-healing architecture continuously monitors the object status and reliability of the system. Kaleidos employs a combination of both multiple distributed copies and erasure coding, for superior data protection. In addition to supporting object-based applications through Kaleidos’ standard S3 access, by using the QStar Cloud Gateway, organizations can also store and access files in the object store using SMB or NFS protocols. The Cloud Gateway can be located at the same site as Kaleidos or, for commercial cloud installations, can act as Edge servers pushing data to the cloud from multiple individual business users. Using the QStar Cloud Gateway option, organizations can create robust disaster prevention scenarios, with the ability to write data to two, three or four replica stores. For example, an organization can create a copy to Kaleidos, a copy to Amazon S3 and a copy to an LTFS based tape library for the lowest cost archive storage. QStar’s Kaleidos offers an optional hybrid architecture that use disks and tapes (LTO tape library), integrating the two technologies into a traditional Object Storage system. This way customers enjoy the best of both technologies: fast data access (disks) and extremely low operating and storage cost (tape). This hybrid and scalable storage solution can be used to archive unlimited amounts of information securely and cost-effectively. QStar Kaleidos employs high-density industry standard servers and high capacity disk storage; and is the only object storage provider that integrates tape and commercial cloud as part of the object store, for lowest-cost long term data preservation. Objects stored in the Kaleidos hybrid architecture are read in precisely the same manner as standard Object Storage protocols, via HTTP, S3, REST API, even though the data is actually stored on tape. Not only are users unaware that the data they are accessing is stored on tape and not on disk, but a sophisticated front-end cache also means that data read/write performance is comparable to that of an Object Storage system. The tape format used is the Linear Tape File System (LTFS), which complies with ISO/IEC 20919:2016 standard. LTFS is a tape operating system providing read/write interoperability between any operating systems, applications and platforms that implement the format. Tape provides a secure, reliable and cost-effective technology capable of archiving data for years or even decades, a scalable memory that can be used to store unlimited amounts of data at a fraction of the cost of any other currently available storage technology in terms of cost per TB and TCO (electricity, cooling, operations & maintenance and lifetime). Kaleidos is a storage system that meets the performance needs of business while being scalable and providing maximum information integrity. The solution is also easy to maintain and scale using a combination of hardware technologies which can manage storage tiers. The result is the ability to manage information without having to worry about future scalability, performance, vendor lock-in or forklift upgrades. It is a new generation of storage device giving the user maximum flexibility to manage vital information assets responsibly. It represents a storage technology that overcomes the limitations of traditional file system-based storage systems. An efficient architecture that seamlessly integrates into any operating environment, data center, private, hybrid, or public cloud. A flexible and low-management solution for storing large amounts of data, it is the ideal response to the exponential growth of data while keeping costs under control. The massive increase in the volume of data demands more efficient systems to store and manage it. 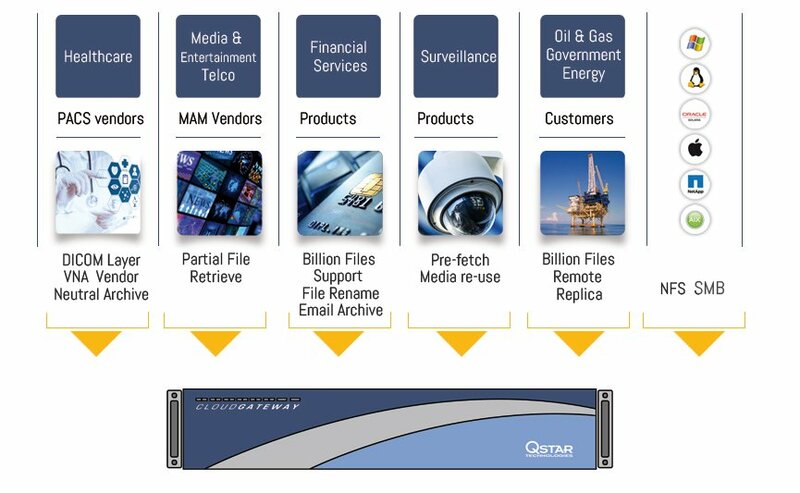 QStar’s Kaleidos Object Storage addresses a very wide range of markets where this solution can deliver real benefits. QStar Cloud Gateway integrates seamlessly into existing infrastructures without changes for either the applications or users. Migrated or moved data continues to appear locally even when stored in the cloud. The simple data read/write approach is virtually compatible with all existing applications. QStar Cloud Gateway can archive unlimited amounts of information securely and cost-effectively within any cloud – private, public or hybrid such as Google, Amazon, Azure, IBM Bluemix and many others. QStar Cloud Gateway is designed to combat the relentless explosion of data, providing transparent and automatic migration of static files from local infrastructure to the cloud, using attributes such as date created, modified, accessed, file owner, size and extension. Meanwhile, it restores data to its original location in real time, completely transparently to applications, network and users.